We arrived in Helsinki and drove to our friends house. After greetings we put the bike in the garage where it will stay while we are in Russia. Then we were given an excellent tour of the area by our friends. 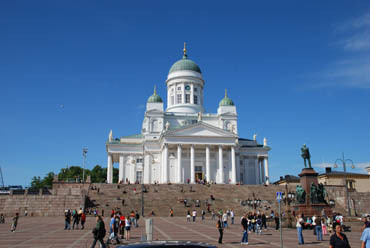 Helsinki is a beautiful city on a waterfront of small islands with lots of green spaces and trees. It is an excellent city to bicycle around in with lots of bike lanes separated from traffic. 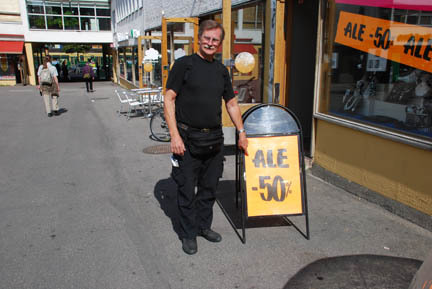 Later we took the bus into downtown and saw lots of "Ale" signs. I actually prefer ale to beer and they were advertising such strong "ale" too!!! Then I found out that it was really a "half-off Sale", what a disappointment!!! 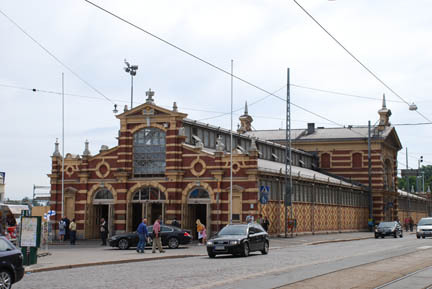 After that we wandered down to the waterfront and walked through the Old Market Building and through the stalls along the embankment. We bought some tourist souvenirs and some nice pictures. After lunch we took the "Pub Tram". It is a 1950's public tram that was converted in the 1990's to be a pub. 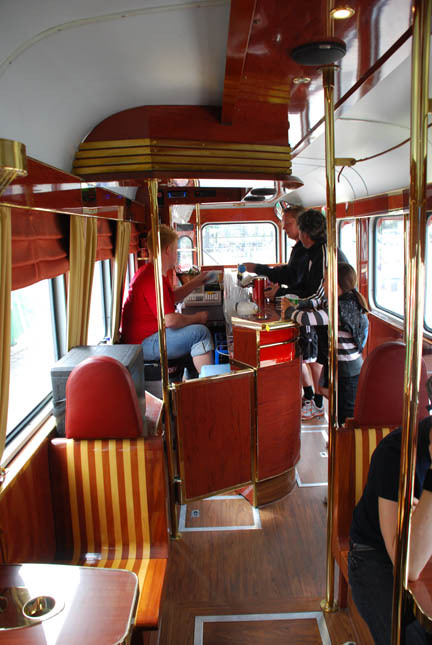 It runs on the same tracks as the rest of the city's trams and resembles a San Francisco trolley and it sells beer and sodas. We had a couple of beers (not ale) and rode it for its 40 minute loop around town. It is sponsored by a local brewery and the tourist bureau. Next were cathedrals and a church. 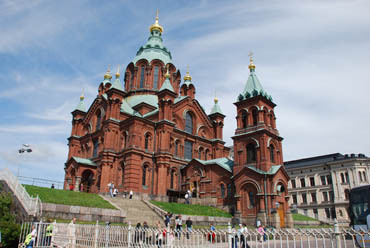 We visited the two cathedrals in town, the one the left is the Greek Orthodox Cathedral and on the right The Lutheran. The difference inside was as striking as the outsides. The Greek was very ornate and was styled more like a Catholic church with its statues and gold and filigree works. The Lutheran was much simpler and almost plain, but with its own style of majesty. And then there was the church carved out of a rock knoll. 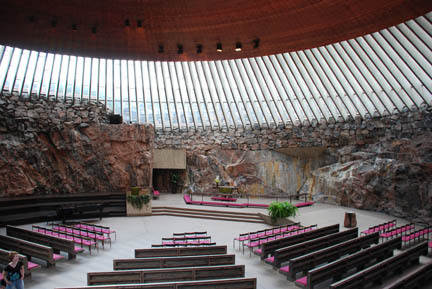 All of Helsinki is sitting on solid bedrock. At places it is showing on the surface and is often been turned into a park with exposed rock to climb on. This rock knoll was hollowed out and covered over to make an impressive church. The roof is a wooden dome that is wide but shallow, sort of like a wok pan turned upside down. We also toured the waterfront looking at old wooden sailing ships. One was a sailing restaurant, but was closed for repairs, and others available for charter. 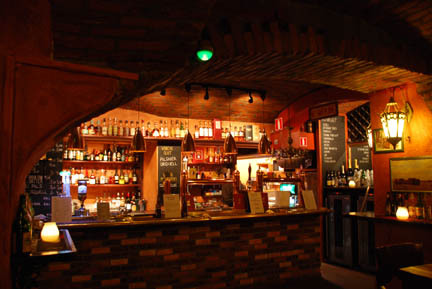 Then we found a basement pub that served local microbrews, including an ALE! As it was now evening, we caught the bus back to the house. 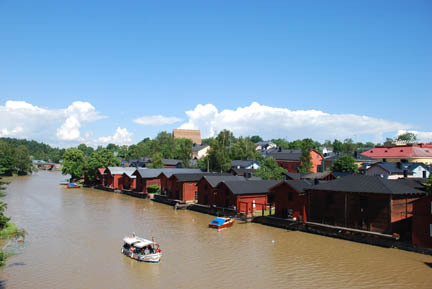 About 30 minutes from the house is the old village of Porvoo. It is a seaport and trading town that originated in 1346. Exotic fruits, spices, wines, coffee and tobacco all passed through here. The red buildings are the old warehouses of the traders and merchants. The "traditional" red color is quite new comparatively, they were painted that color in the 18th century to spruce up the town along the route of King Gustav III of Sweden's visit and have kept it ever since. 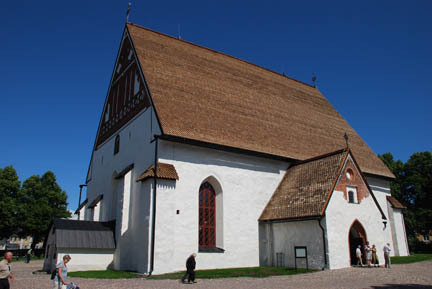 Porvoo has had its share of troubles, the town has burned four times, by the Danes in the 16th century, twice by the Russians and in 1760 a housewife making a fish soup had her fire get away destroying much of the town. And in 2006 someone deliberately set the cathedral on fire. Nothing was said about whether they caught the person or not. The stone walls are the same but all the rest is new. It has just been finished and reopened to the public. We have seen these devices several times in Scandinavia. 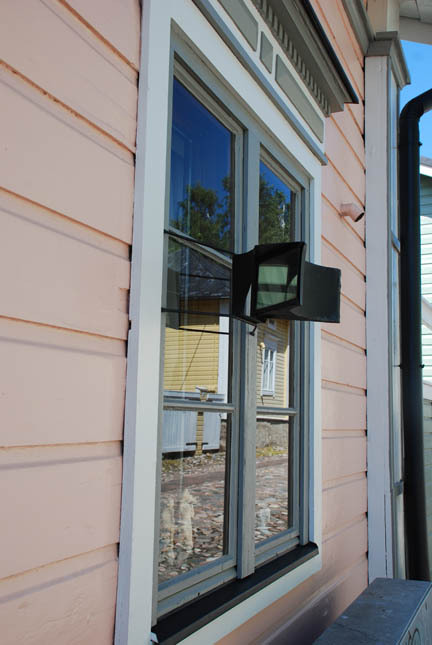 It is a pair of mirrors set at 45 degree angles to the window so that a person inside can see up and down the street without being seen themselves. It is a commercially built item that is for sale in some hardware stores. A great way for that busybody-old-lady-neighbor to keep track of what's happening in town and getting all the good gossip without being seen collecting it! 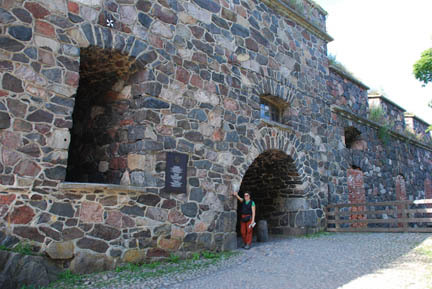 We had planned to visit the "Sea Fortress" on an island in the harbor today, our last day in Helsinki for two weeks, but it is raining and we have things to do to get ready for the next stage in our trip. We are going to Russia; "the Evil Empire" according to our President Regan, but that was before the breakup of the Soviet Union. We are taking the train to St. Petersburg early tomorrow morning. A week later we go on to Moscow and then after another week we take the train back to Helsinki. It should be quite an experience. As in Morocco the alphabet is not in our recognizable Latin character set, we will not be able to read the signs and menus. Sometimes this has interesting results. We'll let you know how it comes out some day. Follow along to Russia. If you don't want to do it chronologically then read on and check out Russia later. We returned from Russia on the late night train. Again we checked out of our apartment and dropped our bags at the train station baggage room and went wandering. I found a wireless hotspot to upload the web pages. We took the metro downtown and wandered around looking for a Mexican restaurant we read about in the guidebook. We never found it but we did find a nice Russian restaurant and we had our last meal there. Then back to the train station. Both the St. Petersburg and Moscow train stations are large cavernous buildings with shops along the sides inside and far too little seating in the center. They could have used three times the number of seats as they had; and there was room for them too. We sat on the stairs to the upper level along with many others. About 8:00 that evening the police and some guys in military uniforms ran everybody out of the building and onto the train platforms. We stood and/or sat around out there for an hour and a half and then people were let back in. It was not a bomb scare. I looked inside the glass doors once and some police were just sitting, very relaxed, in the seating. We can only suppose someone of importance came to see the station and the Russians didn't want them to have to fight through the crowds. When we returned to Helsinki we picked up the bike at our friend's garage and went to the campground, they were at their summer house. We spent three days there relaxing, buying our ferry tickets and visiting the Sea Fortress, a fort on an island in the harbor. The fortress had been enlarged several times over history and had a lot of these walls. It is a popular place for summer picnics and has a beach on the west side. The sea-bus was packed when we went over to it. 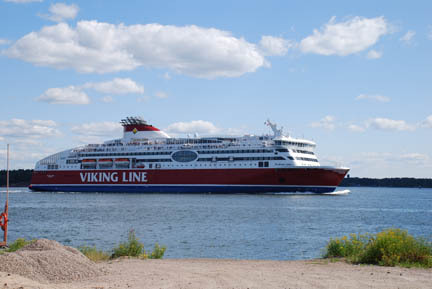 On Wednesday we left on the Viking Lines ferry for the Baltic States. This is our ferry. The picture was taken the day before we left while we were at the Sea Fortress.